Numerous recent reports have made it clear: When it comes to U.S. natural gas development, the Appalachian Basin – Ohio, Pennsylvania and West Virginia’s Marcellus and Utica shales – is the place to be. 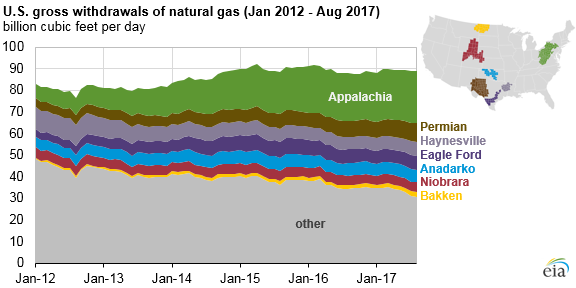 The Energy Information Administration (EIA) released a report this week declaring that the Appalachian Basin has been driving the growth of natural gas in the United States since 2012. The basin has increased natural gas production by 14 billion cubic feet per day (Bcf/d) since 2012, growing from 7.8 Bcf/d in 2012 to an incredible 23.8 Bcf/d in 2017. To give some perspective on just how much natural gas that actually is, watch this video from Cabot Oil and Gas explaining what one Bcf of natural gas can power. Run 82,800 televisions non-stop for a century. Provide electricity for 559,245 houses for a year. Take a cross-country road trip 255,000 times. Travel to the moon and back 12,857 times. 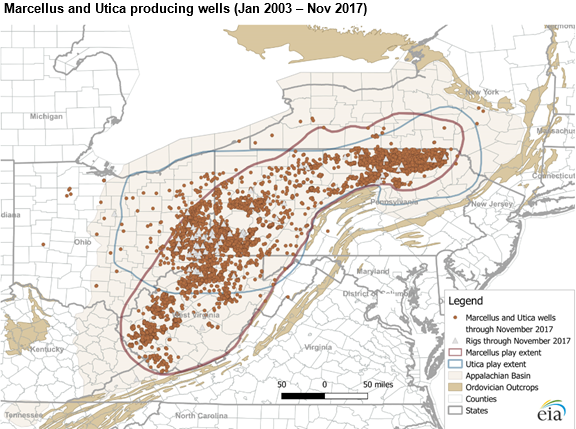 According to the EIA, there are currently about 11,300 wells in the Marcellus and 1,800 wells in the Utica, and each well has increased production by an average of 10.8 million cubic feet of natural gas per month since 2012. The EIA credits this tremendous growth to highly productive wells and improved efficiency that has meant “faster drilling, longer laterals, advancements in technology, and better targeting of wells.” It takes about seven days to complete a well in the region today versus 30 days back in 2011. Further, as the EIA notes, the average laterals (horizontal portion of the well) in West Virginia have increased from 2,500 feet in 2007 to 7,000 feet in 2015, and have extended as far as 15,000 feet in the Marcellus and 19,000 feet in the Utica. This allows for fewer wells and smaller environmental footprints to develop more natural gas. All of these factors combined have begun to make the Appalachian Basin highly attractive for investors. The Fraser Institute recently released its annual survey of oil and gas executives and managers that evaluates global jurisdictions on their attractiveness for upstream (the actual development of the well) investment. The U.S. remains the most attractive country in the world for oil and gas investment, and that includes Appalachia. The basin scored incredibly high overall, with both Pennsylvania and Ohio ranking in the second quintile with scores of over 60 on the Policy Perception Index (PPI). But it is West Virginia that really shines, having bumped up 17 spots to rank fifth globally with a PPI of 90.88. The survey showed marked improvement in the state in terms of quality of its geological database, the availability of skilled workforce, and fiscal terms (licenses, lease payments, royalties, other production taxes, and gross revenue charges, but not corporate and personal income taxes, capital gains taxes, or sales taxes). But it’s not only West Virginia – Appalachia in general has become an attractive place for upstream, midstream (pipelines and related infrastructure) and downstream (end use) investment. For example, there are more than $23 billion worth of pipelines and over $21 billion worth of new natural gas-fired power plants being planned across the three states. Shell Appalachia is investing billions to build an ethane cracker plant in Pennsylvania that will take natural gas liquids from the basin and convert them to ethylene, which is used to make many of the products we use every day. PTT Global Chemical has announced plans for another cracker facility that is in the works in Ohio. It is estimated that production in the basin can support several of these facilities, and on a related note, serious talks are occurring for the possibility of a major Appalachian Storage Hub for the storage of natural gas liquids in the region, predominantly in West Virginia. Not only is shale development having incredible impacts for Appalachian Basin residents in the present – including increased tax revenues, improvements to roads, savings for consumers, improved air quality and more – but the basin’s tremendous growth has opened doors to endless possibilities for future investment that is directly and indirectly related to shale. As we find ourselves repeating often of late – it is certainly an exciting time to live in Ohio, Pennsylvania and West Virginia, thanks to the Marcellus and Utica shales!